This last episode of Top Chef was great. Not only do I love Penn and Teller, but I also love Toby Young. His comments are always entertaining. I am not that fond of Michelle Bernstein as a guest judge. She always seems pissed off and brings completely lame prizes for the elimination challenge winner. Last season she brought copies of her new book and this season a set of pots and pans. Um, cool? 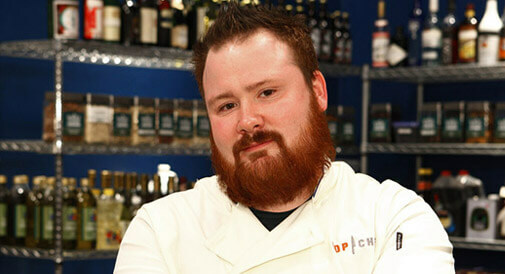 Kevin Gillespie is my pick for winner this season. Not only is he obviously talented, but he seems like a genuinely nice and funny person. He has a cool beard, is very articulate, and is perpetually in a good mood. Also, he kills at horse shoes. He may be one of my favorites of all the seasons so far. I hope the finale is Kevin and the Voltaggio brothers. This entry was posted in food, television and tagged kevin gillespie, penn and teller, top chef. Bookmark the permalink.